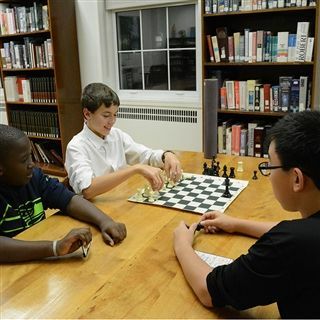 There is a study period each evening for students at all grade levels. Students are placed in Study Hall when they receive two or more unsatisfactory effort ratings in one report. Students who maintain an A- average without any unsatisfactory effort ratings may be allowed the privilege of optional study. With these two exceptions, all students study in their own rooms or in the library. During the day, one-on one support is offered with junior faculty or the LRC coordinator during spares and/or academic support periods. Students may request extra help or may be mandated to attend based on teacher/advisor requests. 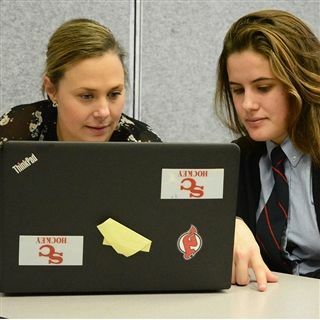 Academic advisors are also available to help their advisees either directly or by recommending other sources of assistance. The library is located on the first floor of Colby and features a vast selection of reading material, including fiction, non-fiction and reference books. Visitors can also read magazines, borrow DVDs or access printers. The reading area is bright and inviting, the perfect spot for studying and reflection. As needed, students may benefit from individual private tutoring as requested and/or recommended by the respective department heads. Parental consent and approval by the Director of Academics is required. Tutoring is currently available in math, science and French. These sessions take place during evening study or on Sunday afternoons. The charge for private tutoring is as follows: junior-level classes $35/hour and senior-level classes $50/hour. Parents must agree to pay the additional cost of this tutoring before it will begin. It is the responsibility of students to notify the supervisor if they will be absent due to any other commitment. After one warning, students will be billed for the missed hour. Students with diagnosed and recently documented special learning needs may receive academic accommodations where necessary and available. Psycho-educational testing will be arranged for students with undisclosed or undocumented needs. This testing and any academic accommodations that require individual services will be charged as an extra billing item. 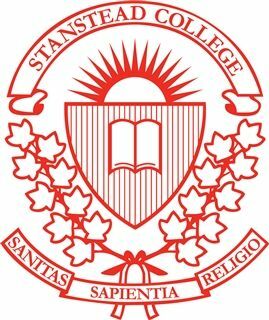 This resource offers teachers, employees and students tips and guidelines for writing in accordance with the Stanstead College style. As with all style guides, the goal here is not to distinguish right from wrong but to create a message that is clear and consistent.